this engine needs to be used for an open world ARPG or something. it has a really nice, high density foliage system, TOD and weather changes, even seasonal changes. it's perfect for it. slower, on foot movement would likely reduce the noticeable LOD pop-in too. i know there's this rumored fable reboot...maybe that's going to do exactly that? Last time i cared about racing games was during the ps2/xbox era and early x360 - GT, PGR...good times. I'm seriously impressed by the Horizon 4's demo. The game probably will get me back to racing games. Everything is really well done and on top of that PC version is perfectly optimized. GTX 1060 still doing it's job for 1080p / 60fps gaming. I'm also excited to see their Fable game, if rumors are true. I have no doubts it'll be a looker. This demo was nuts. still playing it. can't believe how much content they put into just a demo. 2 thumbs up for the content, and another for how much fun the demo is! It's running pretty smooth on a GTX 1060, just tested it. 1440p avg 55 to 60fps. everything is set to Ultra and Extreme except for shadows and rear view mirror. those are set to high. My recording. on a GTX 1060.
it actually has settings to adjust the motion blur and camera field of view for acceleration. I could also take off the glasses, to have the same blur effect. Having the nearest cam view from inside the car seems the best, and most realistic alternative. I have to say Turn 10 deserves a human achievement award for consecutive stellar releases. it's also amazing at how much more depth horizon has compared to the original base series. I think might just stick with the Horizon series from now on. it's very flashy and has lots of exploration. this engine needs to be used for an open world ARPG or something. it has a really nice, high density foliage system, TOD and weather changes, even seasonal changes. I was thinking the same thing while playing it. 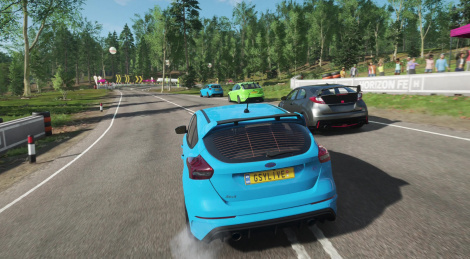 I really want to see what Playground Games can do with a non-racing game. Xbox One X 4K30 & 1080p60 videos please! This was fantastic on my pc. I am able to do ultra with 4x AA on my old 980ti and an 8700k at 1200p. Not a frame dropped from 60. I'll try extreme later. I really love the colors in this game, and the cars are much more responsive than they were in 3. That was a big gripe about 3 I had was the sluggish response when turning. This game really unites. I hardly ever hear anything negative. We'll do that with the final game. You'll even have HDR footage. Easily the best looking console game ever made. I’ve been absolutely floored by just how good this game looks. Even better it’s an awesome racing game that plays and handles great as always. Playground was such a smart and fantastic grab my Microsoft. It should look better on PC but developers wanted to look better on console instead for XBox owners to enjoy. What do you mean by that? I haven't found any info about the pc version lacking graphical features. It will have HDR at launch, and i'm certain there's options for 4K and unlocked/60fps. the game is silky smooth in 1440p with our GTX 1080 Ti but 4K makes it hard to maintain a steady frame rate, even with ultra settings. and i'm certain there's options for 4K and unlocked/60fps. The best available option for a PC that meets the recommended requirements is in ultra, 1440p and 60fps but you can low the settings to high to play in 4K and 60fps but will not be like on the console. You could get the GTX 1080 OverClocked or get a RTX 2080Ti to play in 4K with constant 60fps but that shouldn't be necessary to pair with a console that has far inferior GPU. But the Xbox One X runs it in 4K at 30fps. Can't a 1080 Ti run it steady in 4K at 30fps? Also, are Ultra settings the equivalent of how the game looks on Xbox One X in 4K/30 mode? Yeah if you're willing to lock it at 30 fps I don't see why that wouldn't be easy to match. Not that I understand why anyone would choose to play this at 30 fps when they have a 60 fps option. I don't even think "old" games like Witcher3 and Division runs at 4K/60fps Ultra on a GTX 1080Ti. I posted a youtube link above answering this question by comparing both PC and XBox. I was expecting a 1080 Ti to give much more frames on 4K than a One X. Both One X and 1080 Ti are giving almost the same performance on this game. Have no idea how the developers managed to do that. Great news for Xbox owners who have spent much less money.